Marko Arnautovic and Samir Nasri have been named in West Ham’s starting XI for their Premier League game against Arsenal, who have left out Mesut Ozil. 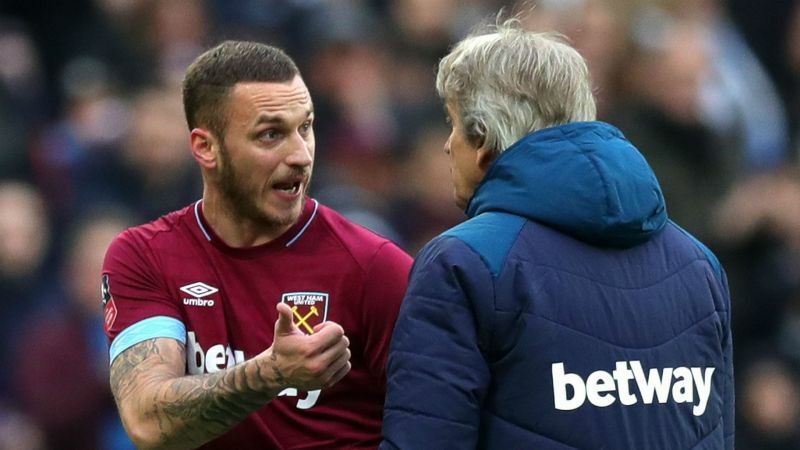 Arnautovic’s future at West Ham was plunged into doubt this week when his agent and brother revealed the Austria forward was keen to leave following interest from an unnamed Chinese Super League club. Nasri, who tempestuously left Arsenal for Manchester City in 2011, will make his Premier League debut for the Hammers after joining as a free agent at the end of last month. The former France international served an 18-month ban from football after receiving an intravenous treatment at a Los Angeles clinic in December 2016, contravening World Anti-Doping Agency rules. There is no place in the Arsenal squad for Ozil despite the playmaker returning to training following a knee problem. Aaron Ramsey takes a place on the bench amid speculation he has agreed to join Juventus on a free transfer at the end of the season. Club captain Laurent Koscielny starts at centre-back a week after withdrawing from Arsenal’s 3-0 FA Cup third-round win at Blackpool during the warm-up.